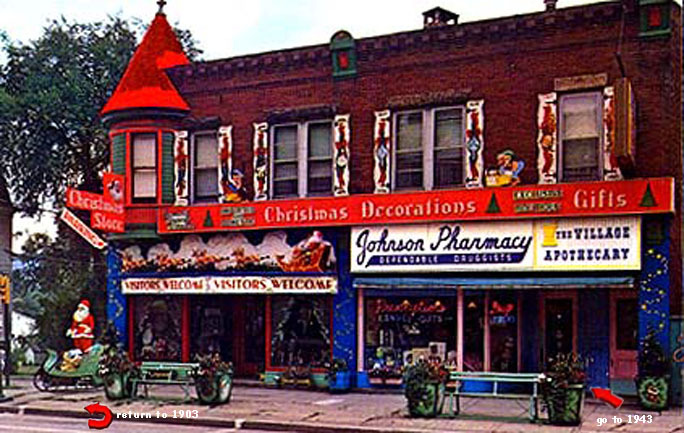 In 1932 Leonard Brynolf Johnson rented the Hamilton Building from the Hamilton family and opened Johnson Pharmacy and a Christmas display manufacturing business. In the former hardware store he opened the Christmas Store...which was to become FAMOUS. By 1935 the Johnson Outdoor displays would become nationally known & the Christmas Store a major American tourist attraction. Smethport's location of US Route 6 and a national advertising campaign brought both Smethport and the Christmas Store to national attention. Engaged in the drug business ever since he obtained employment in a drug store in his high school days, Leonard B. Johnson is today one of Smethport's leading citizens and business men and a prominent figure in McKean County. His early entry upon this work served to finance both his scholastic and professional education and to acquaint him with a number of cities and create the experience that made possible his subsequent success in operating his own establishment in Smethport. Mr. Johnson was born July 5, 1904, in Shawmut, Pennsylvania, son of John A. and Edla Maria (Ostrum) Johnson. His father is a retired railroad foreman in Smethport. Both parents came originally from Sweden. They became the parents of the following children: 1. Manfred H., cashier of the Elk County Trust Company, at Ridgway, Pennsylvania. 2. Elmeda C., wife of George Blakesly. 3. Austrid, wife of David Swanson, of St. Mary's. 4. Ellie M., wife of Russell Hultman, of Ridgway. 5. Leonard B., of further mention. 6. Albert W., a lawyer of Smethport. 7. Emil J., an accountant, also of Smethport. 8. Linda, wife of Russell Norman, of Smethport. 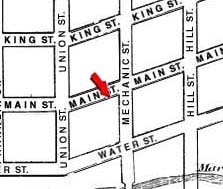 The fifth-named of these children, Leonard B. Johnson, attended grammar and high schools in Smethport, and early took the employment mentioned above, in a local drug store. While a student in high school, he carried on that work. He entered college in 1923 and in 1925 was created a graduate in pharmacy by the University of Buffalo. There he was a member of the University Glee Club and University Band. For a time he was employed in New York City and while so engaged took a course in New York University, and also a night course at Columbia University. At these institutions he majored in Business Administration. 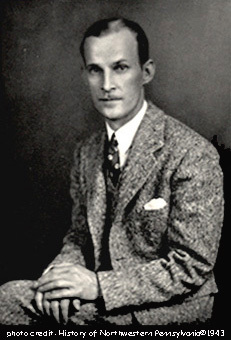 In the earlier years of his work in the drug trade Mr. Johnson was connected with stores in Jamestown, Rochester, Olean and other cities of New York State, mostly as manager of chain stores. He returned to Smethport in 1932, however, and bought the long-established business of H.C. Wells. He modernized this store along the lines with which he had become familiar in other places, making it thoroughly up-to-date, a sort of department store where drugs are only some of a thousand items carried and sold. The business expanded, moreover, under Mr. Johnson's capable direction, catering to people over a wide area and requiring the services of four or five employees. In 1940 Mr. Johnson started another Smethport enterprise, making Christmas displays for lawns, which he at once developed on a large scale and obtained national advertising. Customers come from all parts of the United States, and these special displays are shipped over a broad territory. At the time of writing the organization employs six people in the plant and three sales representatives, but it's outlook is sound and promising. Mr. Johnson has earned the respect of all with whom he is associated, whether in the drug business or in this new trade upon which he has entered, and he has at the same time participated increasingly in general business affairs. He is a member of the McKean County Council of the Pennsylvania State Chamber of Commerce, the Rotary Club of Smethport, the McKean County Pharmaceutical Society (of which he is secretary), the Pennsylvania Pharmaceutical Association. He belongs to the Beta Phi Sigma fraternity and the Methodist Church. Lieutenant Edward Morrison, son of Thomas and Grissie (Hewsome) Morris, baptized in Nazing, Essex County, England, August 8, 1630, died September 14, 1689. His grave was the oldest one in Windham County, Connecticut, and is marked by a stone inscribed: "Here Lied the Body of Lieutenant Edward Morris, Deceased September 14, 1689." He came to the American Colonies, settling at Roxbury, Massachusetts, where he was constable, was selectman from 1674 to 1687, and was representative from 1677 to 1687. Later he became one of the early settlers of Woodstock, Connecticut, where he was the first military officer, a selectman and a leader among the early settlers. He married, September 20, 1655, Grace Belt. Their children, all born in Roxbury, Massachusetts, were: Isaac, Edward, Grace, Ebenezer, Elizabeth, Margaret, Samuel and Martha. Samuel Morris, son of Lieutenant Edward and Grace (Belt) Morris, was born in Roxbury, Massachusetts, April 19, 1671, died at Myanexit Farms," in Thompson, Connecticut, January 9, 1745. He bought from Governor Dudley, a large tract of land in Connecticut, lying along the Myanexit or Quinbury River, on which he settled. He became prominent in the district, and was respected and obeyed by the Indians. He married Mehitable Mayo, and they became the parents of one child, Samuel Morris. This child, Samuel Morris, born August 13, 1695, succeeded his father at "Myanexit Farms," and established a business as a trader, buying up produce and exchanging it in Boston. He married Abigail Bragg. Their children: 1. Samuel Morris, born March 18, 1731, a Revolutionary soldier. 2. Henry Morris, born April 18, 1734, also a soldier in the Revolution. 3. Lemuel Morris. 4. William Morris, born November 28, 1740, a Revolutionary soldier. Lemuel Morris, third of these children, was born July 29, 1737, and married Lydia Wilkinson; they had a son, Samuel Morris. This Samuel Morris, or the Samuel Morris who is believed to be the same, was born about 1767, and died in 1858. He served as a boy in the Revolutionary War. His grandfather was known to be the same Samuel Morris referred to above, of "Myanexit Farms," though it is not conclusively clear which of that Samuel Morris' sons he was. The strongest evidence points to his being a son of Lemuel and that his birth year was 1767. His Revolutionary service must have been slight, such as only a boy of twelve or fifteen years could perform. He settled in Ontario County, New York. He married, and had a son, Simeon Mills Morris. Simeon Mills Morris settled at Springwater, Ontario County, New York, and moved to Toad Hollow, South Bradford, Pennsylvania. He married Louise McCrea. William Schuyler Morris, born October 15, 1815, near Mill Grove, Ontario County, New York, died February 26, 1859. He was nineteen years old when he removed to South Bradford, where he was engaged in farming and lumbering. He was a Republican, a collector of taxes for Bradford Township. He married Eliza Pauline Seamans, of Westfield, Tioga County, Pennsylvania. Jasper Levi Morris, his son, born January 1, 1846, in South Bradford, was engaged in farming and lumbering, and was a pioneer farmer and successful businessman, as well as a Republican supervisor, for thirteen years collector of taxes and for twenty-one years assessor and a school director. He was a Methodist in religious faith. He married, July 9, 1876, Alice B. Hellenbrook, born in Hinsdale, New York. Their son was William John Morris. This William John Morris, father of Mrs. Helen B. (Morris) Johnson, was born June 29, 1877, at Degolia, Pennsylvania, and had a grammar school education in Custer City. He started to work for his father on the home farm of his family at the age of fifteen years, and work on a cattle ranch. After this experience as a cowboy on his uncle's farm, he returned to his father's farm in Pennsylvania and established himself in the dairy business in association with the elder man. For a quarter of a century he continued this connection, but by 1920 had become more active in oil production. Gradually he acquired the original leases on the home farm, as well as adjoining property. Since that time, and especially since his father's death, November 2, 1930, he has given all his time to oil production, controlling more than 180 acres. He is a Republican, a member of the Independent Order of Odd Fellows and a member of the First Methodist Church. William John Morris married, September 25, 1900, Lucy Nippert, daughter of Frederick and Katherine (Hoffman) Nippert. They became the parents of two daughters: 1. Helen Berdena Morris, wife of Leonard B. Johnson. 2. Ruth Louise Morris, wife of Byron B. Porter, a banker, associated with the New York Trust Company, of New York City. Leonard B. and Helen B. (Morris) Johnson became the parents of two children: Leonard Morris Johnson and Cynthia Louise Johnson. History of Northwestern Pennsylvania;Joseph Risenman, Jr.; Lewis Historical Publishing Company, Inc.; New York ©1943.